One of the drawbacks of the cheaper, WiFi-only iPad 2 is that it doesn’t have GPS — so it can’t run any of those beautiful fullscreen navigation apps. GPS is limited to the more expensive 3G iPad models. But if you own a GPS-enabled iPhone, you’re in luck. The WiFi-only iPad 2 inherits GPS functionality when it’s tethered to an iPhone. This was discovered by Kyle Carmitchel on a recent road trip. While his iPad 2 was tethered to his iPhone, Kyle fired up the iPad’s Maps app. 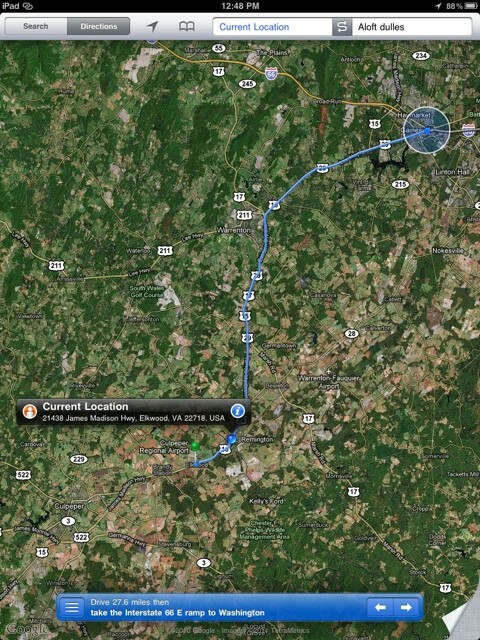 To his surprise, the iPhone began passing GPS information to the iPad. As we got closer, I decided to get some directions to make sure we were on track. I launched the iPads maps app, expecting to navigate the old fashioned way without GPS assistance — knowing full well that GPS only comes in the 3G iPad models. Imagine my surprise when my iPad pinpointed exactly where we were on the road. Kyle has been using the Personal Hotspot feature on his iPhone 4. As he notes, Apple’s WiFi-only iPads and iPhones have for years been able to find their location awareness via a WiFi location service. The service notes the MAC addresses of nearby WiFi hotspots and looks them up in a database of router locations, which gives an approximate location. It is clear I am being fed GPS information from the phone, at what appears to be an interval of once a minute or so between refreshes (likely they didn’t do real time updating so as to go easy on the phone’s battery). So if you’ve been looking at a 3G iPad for the GPS, you might consider the WiFi-only iPad. If you have iPhone tethering, you can use it on the go. Can anyone test this with earlier models of the iPhone and iPad? Does it work with a first-generation iPad tethered to a 3GS?